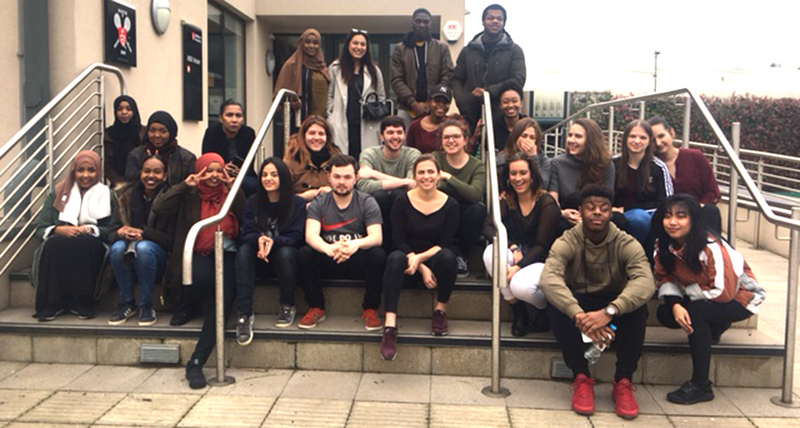 A group of BA Advertising, Public Relations and Media students from Middlesex University are running a Bring and Give (B.A.G) campaign from 27 – 31 March to support the local homeless community. Each year students on the course run a campaign on a topic of their choosing as part of their Campaigns and Social Change module. This year they have partnered with local charity Homeless Action Barnet (HAB) to try and deliver some practical help to local people in need. "We wanted our campaign to make a difference,” explains Kristian Todorova, a media student. “We wanted to do something that helped people in the place where we live and study. We visited HAB and they do amazing work every day so it has been really great to be able to do our bit to help." HAB provide help, support and advice to Barnet’s homeless community – each day they provide meals for up to 60 people and distribute essential items such as clothing and toiletries. The students will be distributing purple bags and encouraging people to fill them with some of the essential items the homeless need including underwear, socks, shaving kits, sleeping bags, shoes, tampons, sanitary towels and clothes. "We have been looking at the ways in which campaigners and protesters have changed the world in big ways and small,” says Martin McGrath, Lecturer in Public Relations and Media. “Our degrees have a very strong emphasis on giving students the kind of practical skills they'll need beyond the University and this project is an example of them taking what they've learned into their community."